Just imagine you are at school studying the nature of volcanoes. Your flight of fancy is somewhere far away picturing the red-hot magna boiling and erupting from the crater. I suppose, such recollections are common for every modern adult. This cannot be said about nowadays' children. Now they have an opportunity to experience the volcano eruption on their own with the help of a Virtual Reality headset. Modern technology makes the impossible nearly possible. Wearables are now conquering the world of education at a brisk pace. Schools are ready to cope with this invasion. In 2015 it was stated that 58% of U.S. teenagers are using tablets at school on regular basis. What is more, the statistics of the year 2009 showed that 93% of classrooms in USA are internet-connected. So there is no wonder that above 71% of students are interested in using wearables while studying. What about teachers? Teachers are interested as well. They found wearables to be those magic tools that will help to track student`s progress and even improve their discipline. So what are the most wide-spread wearables that are gradually being used in education? Bring Your Own Device is the most democratic decision that could possiblly exist. Given its results in the business world, now schools acknowledge its potential as well. BYOD policy gives students the opportunity to choose their own way to gain information relying on their habits and skills. How you will receive information is not the issue, having access to it is what really matters. The Visual Reality headset transports students to any corner of the world they wish to explore. This is not much of an exaggeration. On May 28, 2015, Google announced Expeditions which will "take students places a school bus can't go." Expeditions is an app that can be downloaded on student`s tablet. On Google 's blog the mechanism is explained in clear detail:, "A teacher is able to send synchronized three-dimensional 360° panoramas to each student's Cardboard viewer, pointing out areas of interest in real time and instantly pausing the trip when needed." Thus, now students have incredible opportunity to study Romeo and Juliette in Verona, or to explore the Great Wall of China, seemingly touching it, or to classify animals of Galapagos Islands. This is a tiny camera that makes snapshots throughout the day and provides you with the reel of photos every evening. It gives you a photographic memory. All what you need to do is to attach it somewhere on your clothes. Smartwatches are one of the first wearables used in education. They are cost-effective, small and convenient. Smart watches can be helpful both for teachers and for students. Teachers can track students' attendance, behavior and collect assessment information. With the help of this devise, teachers are mobile and progressive. Students can also use smart watches during physical education lessons by tracking the total amount of steps made and calories burned during a game. Smartwatch will also show heart rate during the physical activity. In science class, students can look up information about chemical symbols or solve equations using the smartwatch's built-in calculator. 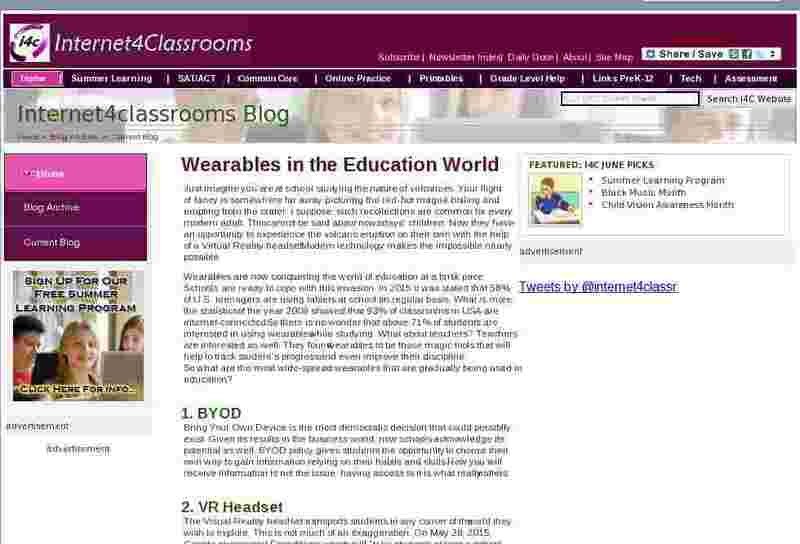 All in all, wearables create a new approach in education world. Not only do they being convenience in studying process, they also change the way people perceive new information. Everything that students explore is brighter and much more informative with the help of wearables. BYOD increases access to technology in the classroom. The VR headset shows you the world as it is. Narrative clip tracks images of the moments of your day. Smartwatches provide feedback and information throughout the day. Our guest blogger is Alexandra Riabtsun. Alexandra works as a Marketing Manager for Glorium Technologies and has been involved in the IT world for more than three years. She believes that Information Technologies are to change the world for the better and is eager to share knowledge and experience gained.